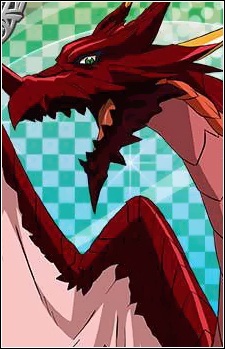 Ddraig "Welsh Dragon, Red Dragon Emperor, Red-One, Breast Dragon Emperor"
Ddraig is one of the Two Heavenly Dragons, the Red Dragon known as the Welsh Dragon and Red Dragon Emperor who resides within the Boosted Gear, wielded by Issei Hyoudou. He is feared among the Angels, Fallen Angels, and Devils for his destructive powers, which are said to be able to kill both Gods and Satans. In the past, Ddraig fought against his arch-rival, the Vanishing Dragon, Albion, which was interrupted by the Angels, Devils, and Fallen Angels who are at war during the time. In anger, both Dragons attacked the leaders of the Three Factions, which led to their bodies being destroyed and their souls being sealed into two separate Sacred Gears, with Ddraig being placed inside the Sacred Gear "Boosted Gear". At one point before he was sealed into the Boosted Gear, Ddraig rampaged in the Realm of the Dead along with Albion. He also fought against Grendel sometime in the past. Ddraig appears in the beginning of Volume 2, introducing himself to Issei. He reappears after Issei’s defeat at the hand of Riser Phenex, telling him about the "White Guy". In Volume 3, Ddraig has a conversation with Issei as the two eventually start a teacher-student relationship, with Ddraig giving advice to Issei during fights such as the fight against Kokabiel and the crisis with the Khaos Brigade in Volume 4. Ddraig also teaches Issei about many things regarding the mythological world. In Volume 5, when Issei attains the Balance Breaker after poking Rias' breast, Ddraig was happy but sad at the same time, he told Issei that he is seriously going to cry someday. In Volume 6, Ddraig cried for the first time after hearing the television announcer of the Underworld calling Issei the "Breast Dragon Emperor" and "Oppai Dragon" after the Rating Game with Sona Sitri. In Volume 7 when attempting to talk to Albion, who shunned Ddraig claiming that he does not have any Breast Dragon Emperor rival, the two of them cried together. While crying, Ddraig protested, claiming that it is all Issei's fault as the two of them questioned how the two proud Heavenly Dragons had become like this. In Volume 10, Ddraig privately contacted Azazel through Fafnir's jewel to ask him to search for a Dragon Counselor as he has been crying unconsciously. In Volume 11, it is revealed that Ddraig suffered a broken heart at the hands of Issei, crying upon hearing the word "breast", and requires medication as well as counseling (10,000 years, to be exact). However, upon Issei's 'death' Ddraig still states Issei was the greatest host of Boosted Gear ever. In Volume 12, Ddraig is able to capture Issei's soul in the Scale Mail, and with the aid of Ophis, transfer Issei's soul to a new body crafted by the Great Red from his own flesh. After the battle with Cao Cao, Ddraig found himself exhausted, and fell into a deep sleep, after making Issei think he was dying. During the first half of Volume 14, Ddraig was still sleeping after using up most of his energy to help restore Issei's body. He later awakens with the help of Fafnir and Vritra during the attack on Kuoh Academy led by Euclid Lucifuge and Grendel from Khaos Brigade. Being sealed within Boosted Gear, Ddraig has yet to show his true personal power and full array of abilities. It is known that he can multiply and transfer power, and has the common powers of Dragons, but it is unknown if this is the full extent of his abilities. When his powers are unsealed, Ddraig is stated to have power enough to rival or kill a God or a Satan.